The Youth View Awards are Jamaican pop culture’s coolest honors, highlighting the most famous and fashionable celebrities on the island. This past February, Vybz Kartel won big at YVA 2016, taking home the award for Favorite Dancehall Artist and beating out Chronixx, Alkaline, Konshens and Popcaan for the top award, Favorite Male Local Artiste of The Year. This was Kartel’s seventh win in a row—a triumph for any artist in such a competitive field. 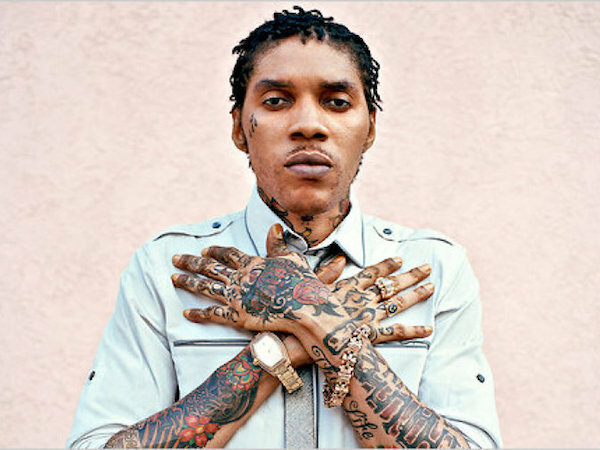 Although he has been behind bars for the past five years, Adidja Palmer—a.k.a Vybz Kartel a.k.a. Di Teacha a.k.a. The World Boss—continues to rule the dancehall scene with new releases dropping every month. How this music is created remains somewhat of a mystery. The official explanation is that the vocals were recorded before he got locked up, and producers are laying them over new riddims. His latest album, King of the Dancehall, was released this past Friday, June 10. It’s not the first time a reggae artist has released music while incarcerated. During a seven-year sentence, Jah Cure recorded a string of hit singles in a prison recording studio—which was considered part of his rehabilitation—transforming him from a talented youth to a major star. Vybz Kartel, however, was already at the height of his powers when he was locked up. When the judge who sentenced him to life offered him a chance to use prison recording facilities, Kartel turned it down. King of the Dancehall, produced by top dancehall imprint T.J. Records, just topped the iTunes Reggae chart in its first week out. The album’s title alone had been news—since the genre’s inception, only a few musicians have proved worthy of the title “king.” Even global artists like Sean Paul and Shaggy did not dominate the Jamaican scene enough to wear the crown. The albino MC Yellowman became dancehall’s first anointed King soon after Bob Marley died. Yellowman would go on to record with Run DMC, and released his major label album, King Yellowman, in 1984. Although Shabba Ranks never used the title King, he ruled the dancehall through the early ’90s and won back-to-back Grammys for his albums As Raw As Ever and Xtra Naked. In 2004, Beenie Man released a song called “King of the Dancehall” after a prolific twenty-year career that included collaborations with international acts Wyclef, Mya and Janet Jackson. Since that time, Yellow and Beenie have traded words over who was the true king. When the judge who sentenced Kartel to life offered him a chance to use prison recording facilities, he turned it down. Many have called Kartel a lyrical genius and prodigy. It’s no secret that Di Teacha was a top student who dropped out to pursue music. Nor that he wrote many of Bounty Killer’s lyrics while spending time in the Alliance crew. It didn’t take long for Kartel to realize he could do it on his own, and during a musical clash at Sting 2003, he battled the great Ninjaman. But things got out of hand when Kartel and his entourage began punching and kicking Ninja onstage. By crossing the line between lyrical and physical clash, Kartel broke a major taboo in dancehall culture. A few years later he accepted an invitation to the wedding of Bounty’s then-rival Beenie Man—another taboo, considering Beenie was marrying Bounty’s ex-girlfriend D’Angel. He would eventually break from Alliance and start his own team, The Portmore Empire. Kartel’s use of shock tactics to keep the public talking—from outrageous lyrics to using “cake soap” to bleach his skin in the late 2000s—proved to be a winning strategy. Despite the fact that Jamaica is actually a very conservative country, explicitly sexual lyricism remains a staple of dancehall culture. Women’s bodies are celebrated to the maximum—the bigger the better. But if his fans didn’t love this sort of thing, he couldn’t get away with it. In the Kartel era, the term “freaky gal” has become a compliment. Despite occasional protests and boycotts—like New York radio DJ Chris Dubbmaster who banned Kartel’s music during Black History Month—the power of Kartel’s brand remains undeniable. His hit song “Clarks,” featuring a young Popcaan, was credited with boosting sales of the British shoe worldwide upon its release in 2010.
International acts soon began reaching out. Rihanna’s debut album included a Kartel collab, and “Pon Di Floor,” the first big hit for Major Lazer, also featured Kartel’s vocals. Although Brooklyn producer Dre Skull insists that his indie label Mixpak is not a dancehall label, it was Kartel’s Kingston Story album that really put Mixpak on the map. Mixpak has since signed Kartel’s former protégé Popcaan to a multi-album deal. And then there’s Drake, whose latest album, Views, is splashed with dancehall flavor. Drake credits Kartel as one of his biggest inspirations. Along with Rihanna, Busta, and most recently Tyga, The 6 God is rumored to be eager to collab with the World Boss whenever the opportunity arises. It’s always a battle against injustice for people who lose their favorite artist to prison. That singer’s music may be the reason a fan can keep going every day. In his book Voice Of The Jamaican Ghetto, which was published during his incarceration, Kartel speaks about poor people’s struggle within a system that makes it harder for them to improve their lives. Urging them to stay strong, he tries to bring awareness to a situation where youths with a good education still find it hard to gain employment. A simple thing like having the postal code of a notoriously poor neighborhood can hinder one’s chances of getting a job. Crime becomes a way of survival, and too many ghetto youths fall into a life of fleeing from police. With the social system so unbalanced, the divide between uptown (well-to-do neighborhoods) and poor downtown areas is a real thing. Like oil and vinegar, the two don’t mix. Reggae’s recent roots revival movement has been touted in some circles as an alternative to the raw dancehall of artists like Kartel. In a recent VICELAND TV special, Noisey Jamaica, Chronixx was quoted as calling Kartel’s music “cannibalistic.” After experiencing some backlash, he posted on Instagram that he respected Kartel’s work, and in a later interview he called Kartel his big brother. Resistance, it would seem, is futile. Say what you want about Vybz Kartel, but recognize the fact that his music never stops playing in the streets of Jamaica. Say what you want about Vybz Kartel, but recognize the fact that his music never stops playing in the streets of Jamaica. There are many awkward stories of celebrities—from Snoop Dogg to Kanye West’s G.O.O.D. Music production team—flying down to Jamaica in search of an authentic dancehall flavor. But they usually spend their time in luxurious vacation studios, places built by rich foreigners to host fellow rich foreigners miles away from Kingston’s soundlabs and dancehalls, the hub of Jamaica’s real music scene. Jamaican artists are sometimes invited to drive hours outside of Kingston to these boutique studios, laying down vocals that may or may not end up on a record. It’s like playing the lottery. But even if they do hit the jackpot, they could face a buy-out clause aimed to minimize proper credit or payment. Whether you consider Vybz Kartel a musical genius or a menace to society, one thing is for sure: it would be difficult to imagine him getting caught up in one of these boutique situations. When he decides to record a song, whoever he works with must enter his kingdom and play by his rules. For most ghetto youths, getting into music can be the difference between living or dying. It’s this aspect of dancehall culture that makes Kartel and others defend it so fiercely—the fact that it’s music made by the ghetto for the ghetto, affording social mobility to an entire underclass who would otherwise be doomed to a life of misery. In Jamaica, you could have all the money in the world but if you don’t have the ghetto youths’ respect, then don’t even bother trying your luck as an artist. Your music needs to resonate with people who work hard every day to survive and keep on top of the struggle. If they cannot relate to you or what you are singing about, then you will probably fall by the wayside. Most great dances in Jamaica have no entry fee. Despite all the flossing that goes on inside, this is the poor people’s entertainment. You don’t need money, but you do need to come correct. Maybe that’s the real reason that Kartel remains king. Vybz Kartel’s King of the Dancehall is out now on iTunes.